Thank you for reading Progress North Texas 2018. This year’s theme is Healthy Communities: Transportation and the Natural Environment. As always, our goal with this annual state of the region report is to provide an update on our transportation system using performance measures. Our region offers residents and visitors a world-class transportation system. Whether people choose to move around by car, train, bicycle or walking, Dallas-Fort Worth has the transportation resources to improve their productivity and quality of life. As our system expands to accommodate our growing region, we must remember to take care of the natural environment so we can preserve our quality of life for tomorrow’s leaders. I am blessed to represent Cedar Hill, a city that boasts a beautiful natural resource – Cedar Hill State Park. It offers visitors an abundance of ways to celebrate the outdoors. The park gives us an opportunity to get away from the hustle and bustle of our daily lives to relax and enjoy nature. As Chair of the Regional Transportation Council, I recognize how the environment and transportation can complement each other. In Dallas-Fort Worth, we’re trying to move people efficiently, which involves big roadway and rail projects worth millions – and sometimes billions – of dollars. We must do this while paying close attention to air quality. Ten counties in the region are in nonattainment for ozone pollution and are working toward compliance of the federal government’s standard. The North Central Texas Council of Governments has many programs intended to help improve the air we breathe, and data shows they are making a difference. For example, the region’s ozone concentration fell to 79 parts per billion last year, the lowest reading on record. It has decreased steadily since the late 1990s. NCTCOG and its partners are working every day to meet the goal of ozone attainment. With Progress North Texas, we hope to inspire you to become involved in transportation planning while reminding you of the importance of being good stewards of our resources – both natural and financial. I invite you to become part of the transportation planning process so that you can impact our system. Come to one of our public meetings. Watch a meeting online. Interact with us on social media. Send us an email. No matter how you communicate, your feedback is invaluable as we continue planning transportation improvements. The Dallas-Fort Worth area continues to experience robust growth, boasting an estimated population of 7.2 million in 2016, according to US Census projections. That represents an increase of more than 143,000 in a single year for the 12-county metropolitan transportation area. Employment in the nation’s fourth-largest metropolitan area grew by 145,000 to 4.79 million. More people working means greater prosperity for the region. With careful planning and coordination with regional, State and federal partners, NCTCOG is meeting the transportation challenges posed by growth, such as providing reliable commutes. According to one measure of congestion, mobility is getting better in the Dallas-Fort Worth area. The region fell from seventh in the country to 10th in 2017, with drivers spending 54 hours in congestion, according to the Inrix Global Scorecard. This was an 8 percent gain over 2016 and represented the biggest jump in dependability of any of the 10 most-congested regions. TomTom, another company that uses data to measure traffic congestion, presents a slightly different picture of mobility, rating DFW No. 34 nationally over a three-year period ending in 2016, the most recent year for which data is available. In Dallas-Fort Worth, motorists are on the roads 18 percent longer because of congestion. By comparison, Austin traffic adds 25 percent more travel time and Houston 24 percent. One thing that is helping the region accommodate its growth is the addition of TEXpress Lanes, which provide drivers the option of paying a toll in exchange for a more reliable commute. TEXpress Lanes have been built adjacent to non-tolled, general-purpose lanes in many of the region’s corridors, including Interstate Highway 35E from LBJ to US Highway 380, a project Inrix highlighted as a potential reason for the improvement in traffic. Reconstruction of the Horseshoe in downtown Dallas was also credited with having an impact on traffic. From 2014-2017, about 70 centerline miles of TEXpress Lanes were added in the region, as projects such as the DFW Connector, North Tarrant Express and LBJ Express were completed. Investments in transportation infrastructure are helping the region absorb the new residents without sacrificing mobility. Approximately $28 billion has been spent since 2000 on transportation construction projects throughout the region, proving residents better mobility amid continued expansion. The Waze Connected Citizens Program is providing cities with the data necessary to improve reliability. In August, the Regional Transportation Council approved grants to six cities worth a total of $131,500 to encourage data sharing. Members of the program share information on road closures with Waze and in return are given access to the real-time data provided to the company by users of the app. Many times, Waze is notified of an incident on the road sooner than 911. By integrating the Waze data with their emergency systems, cities will be better able to improve safety and mobility for drivers. As North Texas continues to grow, so does the number of vehicles on the road. More vehicles can mean increased air pollution, making air quality actions importantto ensure that environmental health is not negatively impacted by transportation. Under the Clean Air Act, the US Environmental Protection Agency established the National Ambient Air Quality Standards, or NAAQS, designed to protect human and environmental health. North Texas meets the federal standard for five of six criteria pollutants. It is still working toward compliance with the ozone standard. Ten North Texas counties are designated nonattainment for ozone. Clinical studies indicate prolonged exposure to elevated concentrations of ground-level ozone may reduce lung function, increase the frequency of asthma episodes, and reduce the body’s ability to resist respiratory infections. Ground-level ozone in North Central Texas is monitored year-round; however, the EPA designated ozone season is from March 1 through November 30, when high ozone concentrations are most common. North Texas counties have been in nonattainment for ozone since 1991 and have since engaged in efforts to reduce emission levels, protect health, and comply with federal air quality requirements. These efforts have reduced ozone concentration levels from 102 parts per billion (ppb) in 1998 to 79 ppb in 2017. Although progress is being made, continued efforts and innovations are needed to keep up with the recently revised ozone standard and rapid population growth. In 2015, the EPA released the new ozone standard, making attainment criteria more stringent than before by reducing the standard from 75 ppb to 70 ppb and increasing ozone monitoring times by an additional month. Ground-level ozone is the result of a reaction of other pollutants – nitrogen oxides (NOX) and volatile organic compounds (VOC) – that mix in the presence of sunlight and heat. These are known as precursor pollutants. Mobile sources, including trucks and cars, accounted for 68 percent of NOX emission in North Texas in 2017. The remaining 32 percent came from area and point sources, including power plants, cement kilns, oil and gas, and smaller sources such as dry cleaners. NCTCOG and the RTC are required to ensure transportation planning and development activities conform to the “emissions budgets” set for the region in the State Implementation Plan (SIP). The SIP outlines strategies to be used to lower ozone concentrations in the nonattainment area. NCTCOG and the RTC focus on actions that reduce NOX and VOCs in order to lower ozone. From fancy sports cars to affordable sedans, EVs are a quickly growing market in North Texas. EVs are a key component to reducing transportation-related pollution. They produce no tailpipe emissions when running on electric motors. They can range from zero-emission vehicles for all-electric vehicles, to low-emission plug-in hybrid electric vehicles that run partly on electricity and partly on gasoline engines. EVs Texas have accounted for an overall reduction in pollution, even when considering any increase in emissions at a power plant. As seen in the graph below, the number of EVs in North Texas grew from approximately 240 in 2011 to over 4,500 today, an increase of nearly 2,000%. Entities across North Texas have worked to build EV charging stations across the region to allow drivers to get around without fear of “running out” of battery power. By the end of 2017, there were approximately 300 EV charging stations in North Texas. The Department of Energy’s Alternative Fueling Station Locator is an integral tool in communicating these available EV Charging stations to the public through an easy searchable map function. For access to the AFDC Station Locator and other EV information, visit www.dfwcleancities.org/evnt. While still a developing technology, AVs, are becoming an increasingly more common. Because AV development has become synonymous with EVs, implementation of AVs have the ability to be a game-changer in regional air quality efforts as an additional zero emission transportation option. In August 2017, the City of Arlington debuted a pilot project of two driverless low-speed vehicles that took fans to Globe Life Park or AT&T Stadium via trails in the adjacent parks. For more information, visit Arlington's website. Air Quality cold benefit from additional funding provided by the $14.7 billion settlement Volkswagen was ordered to pay in 2016. Courts determined the company used equipment to help vehicles trick federal emissions tests. Texas was designated as a beneficiary of approximately $209 million from the Environmental Mitigation Trust. Funds will be administered by the Texas Commission on Environmental Quality. For more information, visit www.tceq.texas.gov/agency/trust. NCTCOG staff administers many air quality programs and initiatives to support emissions reductions across North Texas. Programs predominantly focus on light and heavy-duty vehicles and equipment as they represent the majority of ozone forming emissions in the region. The AirCheckTexas Drive a Clean Machine Program is designed to help vehicle owners comply with vehicle emissions standards by offering financial incentives to repair or replace vehicles, and allows local residents to contribute to the regional air quality solution. If eligible, vehicle owners can receive repair vouchers up to $600 toward emissions repair assistance or up to $3,500 toward a qualifying replacement vehicle purchase. In 2017, over 2,600 vehicles were repaired or replaced through AirCheckTexas, www.airchecktexas.org. Air North Texas is an outreach campaign created to educate North Texans on simple things they can do in their everyday lives, such as carpooling and properly maintaining their vehicle, to help reduce emissions and prevent ozone from reaching unhealthy levels. Pollutant-specific alerts are sent when air quality is projected to reach the unhealthy range. www.airnorthtexas.org. The Dallas-Fort Worth Clean Cities Coalition works to advance energy security, protect environmental and public health, and stimulate economic development by promoting practices and decisions that reduce petroleum consumption and improve air quality. www.dfwcleancities.org. NCTCOG recently completed a project serving as a SolSmart adviser to the region. SolSmart is a national designation program designed to recognize communities that have taken steps to reduce local barriers to solar energy and foster the growth of mature local solar markets. As a SolSmart adviser, NCTCOG worked with local cities to revise solar permitting, inspection, and zoning processes to reduce administrative barriers to solar, and assist with submitting for SolSmart designation. Five cities have earned designations: Cedar Hill (Gold), Kennedale (Silver) and Denton, Lewisville and Plano (Bronze). Dallas-Fort Worth's public transportation system is operated by three major authorities and numerous smaller agencies and private service providers. Dallas Area Rapid Transit, Trinity Metro (formerly known as The T), Denton County Transportation Authority and smaller agencies provide North Texans with Regional Connections to education, jobs, health care and other opportunities. In fiscal year 2017, DART, Trinity Metro and Denton County Transportation Authority work with smaller transit agencies to provide North Texans with regional connections to education, jobs, health care and other opporunities. In fiscal year 2017, DART, Trinity Metro and DCTA provided over 75.6 million passenger trips, while the smaller transit agencies provided over 412,000 trips in the region. Ridership is expected to grow steadily with continuous expansion of the transit system. For example, TEXRail, slated to debut by late 2018, is projected to carry more than 8,000 passengers daily in its first year. Intercity bus and rail operators such as Amtrak and Greyhound, as well as companies such as Uber and Lyft, have been moving thousands of people daily throughout the region. Access to public transportation remains a challenge, particularly for seniors, individuals with disabilities, individuals with lower incomes and others considered transit-dependent. To fill current gaps in service, public agencies have increasingly leveraged partnersips with private-sector and nonprofit organizations to implement innovative solutions. Arlington is one of the first cities in the region to offer on-demand ridesharing service through a partnership with the microtransit proivider Via. For a flat fare, Via transports people within a service area that includes the Entertainment District and the University of Texas at Arlington. In January 2018, DCTA announced a partnership with Lyft in which the agency offers a $2 discount for Lyft rides in Highland Village and north Lewisville. This is another option for people to access transit stations or other destinations. Also, transit agencies and cities — including DART and Arlington’s Handitran — supplement current transit and paratransit service by partnering with taxi companies to provide trips to medical appointments and grocery trips. Tarrant County and Catholic Charities of Fort Worth have worked together to build the Tarrant Riders Network, composed of volunteer drivers to provide affordable rides for transit-dependent individuals and resources for other agencies seeking to implement their own volunteer driver programs. Fort Worth B-Cycle, a nonprofit organization, operates a docked bikeshare program in partnership with Fort Worth and Trinity Metro. In addition to the expansion of dockless bikeshare systems in 2017 in Dallas, these bicycles are providing opportunities for people to make critical first/last-mile connections to their destinations. These innovative partnerships have made public transportation in the region more accessible, efficient and cost effective. They also provide a sense of independence to residents and build healthy communities by ensuring greater access to essential services. Technology has continued to enable seamless public transportation service experience and influenced how people access transit services. Using the Federal Transit Administration’s Mobility on Demand grant, DART is developing an integrated mobile app to include partners that provide last-mile connection to DART stations for ticketing, scheduling and information. The updated mobile app has been tested at a series of pilot projects implemented at locations including the Legacy business district in Plano and in southern Dallas. Various plans, studies, and compliance efforts for public transportation have taken place in the region. Mobility 2045, the new long-range transportation plan under development, is the blueprint for the region’s multimodal transportation system and guides federal and state transportation funding expenditures for the next 20-plus years. Access North Texas, the public transit-human services transportation coordination plan approved in March 2018, identifies strategies to serve older adults, individuals with disabilities and individuals with lower incomes with public transportation based on a combination of research, technical analysis and public input. NCTCOG is required by federal legislation to set regional transit asset management targets and evaluate performance of various transit assets annually in coordination with transit providers. The regional targets and tracking of transit assets focus on ensuring public transportation vehicles, rail lines and other capital assets are in a state of good repair. ** This asset category includes a number of assets that were rebuilt near the end of their useful life. The analysis above assumes a minimum extension of 10 years of useful life, which may be too conservative (i.e. vehicles may be in better condition than expected based on completed rebuild activities). Important investments have been made in recent years to improve the region's transportation system. Significant roadway and rail projects are allowing the Dallas-Fort Worth area to accommodate the new residents moving to the region while preserving the quality of life for all. The region has been successful in implementing major projects over the past several years. Last year, approximately 48 miles of freeway/tollway capacity was added. of freeway/tollway capacity was added. In fiscal year 2017, approximately $571 million in federal funding was obligated for roadways. Combined with transit and bicycle-pedestrian expenditures, more than $836 million in federal money was provided for Dallas-Fort Worth transportation projects. The multimillion projects are necessary to accommodate the region’s growth. But improving the transportation system involves more than building new infrastructure. Continued growth and major weather events will increase the burden on the existing facilities. To sustain the region will require attention paid to the natural and built environments. The weather, soils and geography of North Texas can make maintenance even more expensive than other parts of the country. Periods of drought, followed by heavy rains can cause the soils to shift, leading to cracks in the roadway. Those must be repaired – often repeatedly – which requires significant investment. According to Mobility 2040, which projects transportation needs through 2040, more than $37 billion will be spent on infrastructure maintenance over the life of the plan. In many cases, NCTCOG and its partners are trying to work within the existing footprint of a particular road, saving money by preserving as much of the existing structure while increasing capacity. Maintenance is just as important as new capacity because the new projects are built to last up to 50 years or more. Facilities across DFW are in need of additional capacity. Through asset optimization, NCTCOG and its partners seek to add to main lanes, frontage roads, cross streets and other facilities as much as possible instead of entirely rebuilding corridors. This increases the lifespan an effectiveness of the facilities more economically than a complete rebuild. Maintenance is also an important component, given the new bridge and pavement standards that will soon be required. Understanding that the region will be responsible for reporting on the condition of its roads and bridges, planners must set aside enough money to maintain current assets, as well as those to be built in the future. The City of Dallas is dedicating $500 million-plus to streets in its recently approved $1 billion bond package. That is expected to address just a fraction of the needs. The City of Irving will spend $100 million on its streets over the next five years as part of its capital improvement program. This is also less than is needed to maintain roads in hteir current condition. There are 109 projects ranging from $800,000 to $1 billion that would require environmental clearance over the next three years. Of these, 105 are from TxDOT districts and four projects are from NTTA. NCTCOG has a program to further expedite these projects. The Section 214 program, authorized under the Water Resources Development Act, allows the Council of Governments to pay the salary of a US Army Corps of Engineers employee responsible for working on NCTCOG projects. Projects considered to have a major regional impact are handled as part of the program. With a dedicated staff member and increased coordination with partners, the environmental review of projects is being expedited. For example, in the two years since the program was first authorized, an average of 177 finalized actions have occurred annually. Prior to the agreement, only 14 such actions – decisions deemed necessary for the continuation of a project – were completed yearly. Under the program, all general permits were issued within 60 days. More permits lead to more completed projects. The completion of more projects, both large and small, means a more reliable system. Fueled by calories and emitting no air pollution, active transportation (bicycling and walking) is an environmentally friendly mode of travel. Bicycling and walking for short trips, such as to the grocery store or to work or school, helps reduce congestion by removing vehicles off the roadways. Active transportation also provide opportunities to increase physical activity and improve air quality, contributing to the quality of life and health of residents across the region. NCTCOG commissioned a survey in the spring of 2017 of residents in the 12-county Dallas-Fort Worth area to capture the views of the public-at-large about bicycle use across the region to help guide future bicycle plans and projects that affect bicyclists. The survey was conducted randomly by phone, both in English and Spanish, and garnered 1,250 interviews with a 95 percent level of confidence. The survey questions were similar to those used in a national survey and in cities such as Austin and Portland, Oregon, to create a DFW standard. In addition, questions helped determine residents’ perception of factors in their neighborhood that might help or hinder bicycle use, frequency of bicycling and perceived barriers to bicycling. Behaviors such as helmet use and support for improvements to bicycle facilities were also measured. About 55 percent of respondents would like to bicycle more than they do today. The closer respondents lived to a bicycle lane or trail, the more likely they were to report riding a bicycle. Weather and the lack of bicycle facilities were the top obsticles to bicycling more often. A significant majority of respondents reported they felt more comfortable riding on trails or on-street bikeways separated from traffic than riding on roadways with no designated bicycle facilities. About 58 percent of those who bicycle said hey wear a helmet at least some of the time, but usage varied by age. The results from the bicycle survey demonstrate North Texans want a seamless network of bicycle facilities to overcome preconceived barriers to bicycling for transportation. In June, the Regional Transportation Council (RTC) awarded $34.2 million through the Transportation Alternatives Set-Aside Program Call for Projects. Active Transportation projectsreceived $22 million to construct primarily shared-use paths and on-street bike lanes. Projects providing enhanced regional connections to schools and large employment centers and transit stations were prioritized. A noteworthy project receiving funding on the western side of the region includes the 1.5 mile Dallas Road Transit-Oriented Development Corridor/Cotton Belt Trail extension in Grapevine. This project will connect the Cotton Belt and Links trails, and provide pedestrian and safety improvements along West Dallas Road. The connection will make it easier residents to use the funded bicycle and pedestrian facilities to reach the TEX Rail station when the commuter line opens. An example on the northern side of the region is the Sycamore-Welch Active Transportation Connection in Denton. This 1.6-mile project will provide a combination of a shared-use path and bike lanes to link the University of North Texas to DCTA's downtown Denton station. Projects intended to help students across the Dallas-Fort Worth area ride their bicycles or walk to school more safely received a significant boost from the RTC in 2017. These projects will benefit students, had strong community support and will improve quality of life. In all, 34 projects spanning 16 communities and eight counties were funded as part of the Transportation Alternatives Set-Aside Call for Projects. The entities awarded funding will contribute an additional $12.4 million in local match. The latest round of funded active transportation projects will expand the region’s existing bikeway network. Currently, there are 764 miles of existing off-street paths and 207 miles of existing on-street bicycle facilities. With so many miles in the region’s bikeway network, there are boundless opportunities for people to get outside, connect with nature and their community, and walk or bicycle to destinations. Dallas Fort Worth International Airport is the economic engine that drives the region. It is the fourth-busiest airport in the world, serving 67 million passengers in 2017, a 2.3 percent increase over the previous year. This translated to almost 1,800 flights a day, according to data provided by DFW Airport. Capacity at DFW is approximately 4,080 flights a day, according to the FAA. The number of flights at DFW Airport dipped slightly in 2017, but the number of passengers served at each of the region’s major commercial airports continued to grow. Together, DFW Airport and Love Field have the capcity to handle more than 5,100 flights per day. Activity at Dallas Love Field Airport continues to grow. In 2017, the airport experienced a slight increase in daily flights (623), continuing a trend that began with the 2015 repeal of Wright Amendment flight restrictions. Love Field maintains enough capacity to handle the increase. The airport can accommodate approximately 1,024 flights per day, according to the FAA. Aviation involves more than just moving people. Valuable freight that must arrive at its destination quickly is often shipped through the air. Dallas-Fort Worth has three facilities that handle air cargo. DFW Airport and Love Field may be obvious answers, as the region’s primary commercial airports. But Alliance Airport, in the heart of the north Fort Worth’s AllianceTexas development, continues to experience growth in the amount of air cargo it handles. Air cargo tonnage shipped continued to increase in 2017, rising nearly 8% at DFW and almost 4% at Alliance, the region's leaders in cargo shipped by air. A new type of aircraft are taking to the skies at increasingly high numbers. In 2017, there were almost 16,000 unmanned aircraft systems (UAS), also known as drones, registered in Dallas-Fort worth. Approximately 14,300 of these belonged to hobbyists, while 1,600 were earmarked for other purposes, such as commercial use. In 2017, NCTCOG, elected officials and community leaders concluded Joining Forces, a study to help North Texas military installations and their neighbors collaborate on compatibility issues. This Joint Land Use Study recommends communication and land-use strategies that support continued military capabilities. Funded by the Department of Defense Office of Economic Adjustment, the project involves the communities and military operations of Naval Air Station Fort Worth Joint Reserve Base, Redmond Taylor Army Heliport in Dallas, Fort Wolters training center in Mineral Wells and Camp Maxey training center near Paris. NCTCOG collaborated with cities and counties surrounding the military installations to plan and carry out specific actions that will promote compatible community and economic growth. Throughout the project’s duration, the planning team interviewed key stakeholders, facilitated public meetings and coordinated several rounds of policy committee meetings to establish priorities for the study, gather data, and identify challenges and opportunities. The collaborative process has developed over 150 recommendations covering regional as well as individual installations and community-specific actions. Many recommendations focus on enhancing and formalizing communication. Others look at enhanced economic development, planning and land-use techniques, and improved physical security. NCTCOG staff will continue to work with community and military partners to implement recommendations. More information about Joining Forces can be found at www.joiningforcesntx.org. Trucks are the most common vehicles depended on to move freight to its destination. Anyone traversing the streets and highways of Dallas-Fort Worth can understand how important trucks are to the overall supply chain. To ensure freight continues to move efficiently, it is helpful to know where trucks are most commonly traveling. NCTCOG has completed roughly 1,000 traffic-classification counts for the region. The initiative provides planners a more complete picture of where truck traffic is most heavily concentrated throughout the day and will help them continue to refine the transportation system. The data from this project confirms what planners suspected about freight movement: The percentage of trucks is heaviest in areas such as AllianceTexas, southern Dallas and the SH 360 corridor south of DFW Airport. All are populated with distribution centers and warehouses and serve as essential hubs in the movement of goods. AllianceTexas and southern Dallas are also home to intermodal facilities, which depend on trucks to transport products to the store, manufacturer or customer. The information from this traffic-counts project will also help NCTCOG staff develop better traffic models, leading to improved mobility, system reliability and emissions forecasts. A region so dependent on trucks should have adequate facilities for the freight carriers when they are between deliveries. The regional Truck Parking Study assessed the overnight and temporary truck parking needs throughout Dallas-Fort Worth. Content from previous truck parking studies, data collection and driver surveys served as the foundation for the analysis, which resulted in key findings about the region’s need for additional truck parking. The analysis also identified specific areas with the most critical truck parking priorities -- the Corridors of Concern. Recommendations were developed to provide guidance to address these findings. The recommendations included in this study provide local, regional and State agencies, along with private entities, verifiable data and opportunities to improve truck parking infrastructure. Increasing the number of viable truck parking spaces would help truck drivers comply with federally mandated regulations, improve roadway safety and enhance regional economic development. The study is in the final stages of review and will be published in 2018. The technology by which goods are delivered to homes and businesses is changing. In some areas of the country, autonomous trucks are being tested or actually hauling goods. (Currently, they have a human driver equipped to take over in case of emergency.) The benefits of automated trucks look promising. Among the trucking industry’s biggest issues are safety, efficiency and labor shortages. Automated trucks can travel continuously, thereby reducing delivery time. Increasing automation can also improve safety and help lessen the driver shortage issue, especially in long-haul trucking. However, automation is a complex and dynamic concept. The technology needs to be further refined and will require proper regulations in place to regulate how automation will be used in the trucking industry. These topics are being considered at international, national and regional levels. NCTCOG is planning for the future with the different levels of automation in both passenger and freight vehicles. NCTCOG continues to focus on improving the safety of the transportation system by concentrating on programs and projects that assist in reducing the number of crashes, serious injuries and fatalities on the region’s roadways. In 2017, Dallas-Fort Worth experienced a total of 123,481 crashes, 4,327 of which resulted in a serious injury or fatality. There was a 6 percent decline in the number of crashes from 2016 to 2017. Fatalities increased slightly, but with initiatives such as the wrong-way driving pilot project, work is being done to reduce highway deaths. The numbers reflect the importance of training for agencies and responders responsible for managing and clearing traffic incidents on the regional and local roadways. Quick clearance reduces the chance a motorist or first resonder will be involved in a saecondary crash. NCTCOG continues efforts to improve roadway safety by offering Traffic Incident Management Training to local police, fire, wrecker, EMTs and Courtesy Patrol agencies. These agencies work together when responding to enhance safety for motorists and emergency personnel, as well as to clear crashes more quickly, which helps reduce upstream traffic collisions. More than 2,800 emergency responders from 120 cities and counties throughout the region have completed the TIM training offered by NCTCOG since 2003. In 2017, 106 trainees completed the course. The sheriff’s offices in Dallas and Tarrant counties also help stranded motorists along many of the region’s freeways. In 2017, more than 92,000 drivers were aided by the counties’ Mobility Assistance Patrol Program, also known as Courtesy Patrol. The North Texas Tollway Authority responded to more than 26,000 MAPP requests on its system of toll roads. There were more than 11,000 assists on the region's TEXpress Lanes. Another important safety endeavor is the Takata airbag recall. At least 22 people have been killed worldwide and more than 200 injured as a result of airbags with bad inflators. NCTCOG is involved in an outreach effort to educate people about the importance of getting their defective airbags replaced. Fewer than half of the airbags under recall have been addressed, so the outreach effort continues. NCTCOG has also worked hard in recent years to decrease crashes at railroad crossings. Those efforts continued to pay off in 2017, as the number of incidents at crossings dropped to 32. In 2000, there were 67 such incidents. NCTCOG also tracks the number of wrecks involving bicycles and pedestrians. There were 600 bicycle and 1,453 pedestrian crashes in 2017. There are efforts to improve on these statistics, as well. Since 2015, NCTCOG has used the Look Out Texans campaign to help the public understand the importance of driving, walking and bicycling safely throughout the region. There are 21 tips available at www.lookouttexans.org to encourage safer travel. In addition, the Texas Department of Transportation-funded campaign offers school resources and videos to further illustrate people’s rights and responsibilities on the roads. The federal transportation legislation, known as the Fixing America’s Surface Transportation, or FAST, Act, set targets for safety that NCTCOG and metropolitan planning organizations must strive to meet. TxDOT developed a list of data-driven targets as part of a collaborative process. The regional goal for 2018 is no more than 0.96 fatalities per 100 million vehicle miles traveled, 0r 665. In approving the regional targets, the RTC also added an aspirational goal stating that one death on North Texas roadways is too many. With continued cooperation, NCTCOG and its transportation partners can meet these targets and make the system safer for both motorized vehicles and active modes of transportation. Transportation and education intersect in many areas, providing NCTCOG the opportunity to reach the decision makers of the future. For example, example, planners are actively working to generate more interest in aviation careersand provide educational opportunities for a prospective aviation workforce. is Safe Routes to School, a national movement aimed at encouraging more students to walk and bicycle to school. Campuses throughout the region are benefitting from work done to make it safer for students to choose active transportation options. NCTCOG reached more than 13,000 students at over 25 events in 2017. Among the events were STEM expos and festivals, career days, job fairs, air shows and more. The North Texas Aviation Education program aims to connect potential aviation and aerospace professionals with careers, programs and academic institutions on a regional level.The program's website, located at www.nctaviationcareers.com, helps students acess training, educational requirements, funding resources and real-time employment opportunities. Activity on the careers site has grown substantially since its 2012 launch. Last year, visits were up 17 percent. . Adding value to the aviation education pipeine is subsequently fueling what is currently one of the top aviation and aerospace labor forces in the country. Mobile gaming is another opportunity to reach today’s youth and inspire them to think about their future. NCTCOG partnered with the DFW Regional Aerospace Consortium, a Workforce Solutions for Tarrant County initiative, local aerospace employers, and the University of Texas at Arlington to develop FLYBY DFW, a game available on Apple and Android devices. Participants can pilot aircraft such as Lockheed Martin's F-35 Lightning II, Bell's V-280 and Airbus Helicopters' H155 and EC255 through virtual recreations of Fort Worth Alliance Airport, the Dallas-Fort Worth city scape and Corpus Christi waterfront. FLYBY DFW was designed to stimulate interest in aviation at a younger age while sharing interesting local aviation trivia. NCTCOG will continue its efforts in aviation outreach to help the DFW region fill the current and future aviation staffing deficit by preparing tomorrow’s workforce today. NCTCOG worked with local communities in 2017 to prepare Safe Routes to School plans for four schools. 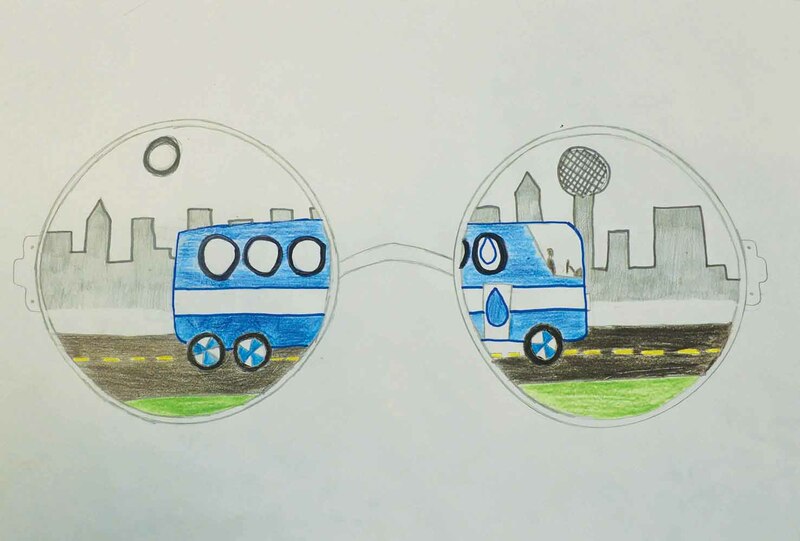 Applied Learning Academy in Fort Worth, Delaney Elementary and Arthur Intermediate in Kennedale, and Ignacio Zaragoza Elementary in Dallas all received assistance with blueprints for making their campuses easier for students to access via walking or bicycling. As a result of this project, Dallas has completed restriping of crosswalks around Zaragosa Elementary. Additionally, federal and local funds have been identified to make the improvements in Fort Worth. NCTCOG also hosted bicycle rodeos at select schools, led by instructors from BikeDFW, a nonprofit organization working to promote bicycling for transportation and recreation. Participants received free bike helmets, bike tune-ups, information on helmet-fitting, safety skills and the opportunity to participate in a safety obstacle course. Resources are available to help parents and community members begin Safe Routes to School in their schools. For more visit www.nctcog.org/schools. The RTC awarded $12.2 million in federal funds to 22 Safe Routes to School projects. These projects will provide sidewalks, crosswalks, trails, and a range of other improvements that will make it easier and safer for students to walk and bike to 30 elementary and middle schools across North Texas. This funding included over $3.2 million to the City of Fort Worth for Safe Routes to School projects benefiting seven schools. The City of Burleson was awarded $1.7 million in federal funds to construct a network of bicycle/pedestrian paths, separated bikeways, sidewalks, and other improvements connecting to Kerr Middle School and J.W. Norwood Elementary School. This project will benefit students, had strong community support and will improve the quality of life of residents of the community.Most notably, this funding included over $3.2 million to the City of Fort Worth for Safe Routes to School projects benefitting seven schools. In addition, the City of Burleson was awarded $1.7 million in federal funds to construct a network of bicycle-pedestrian paths, separated bikeways, sidewalks and other improvements connecting to Kerr Middle School and J.W. Norwood Elementary School. This project had strong community support and will improve the quality of life of residents by providing more choices for transportation. NCTCOG staff members address transportation and air quality issues by focusing first on the people who live in the region. This approach helps develop innovative ways to improve mobility and clean the air. The intent is to listen so that staff members can make informed decisions about the multimillion-dollar projects being considered. Each year, the NCTCOG Transportation Department reaches people of all ages at community fairs, schools and civic organizations. These venues provide opportunities to educate residents about topics that affect them directly – and receive immediate feedback. It is important to maintain a conversation with the public so planners are not doing all the talking. An active outreach strategy helps planners discuss transportation and air quality with people face to face. The department participates in events throughout the year, with a significant push each spring, as the weather is warming up. In spring 2017, the department was involved in 13 events attended by nearly 140,000 people. Public meetings are an important method of reaching residents to explain key projects and programs, as well as gather feedback directly from the users of the transportation system. The department regularly meets at locations throughout the 12-county area to discuss topics important to the transportation system and air quality of the region. Not everyone can attend a meeting in person, so the department streams RTC and public meetings live, allowing people who watch all or part of the proceedings from their computers or on their mobile devices. An average of approximately 60 people per month watched meetings live in 2017, with activity peaking in August at 151. Archived video of public and RTC meetings is also available. Other than meetings and outreach events, NCTCOG uses a variety of methods to communicate with the public, including publications, social media and media relations. The department covers a variety of topics throughout the year. Sometimes, certain subjects appear across media platforms more than others. Air quality was the most popular topic, appearing seven times, followed by funding (five times). The department also uses social media to encourage public engagement in transportation decisions. Its audience continued to grow in 2017, led by Facebook (34 percent). The department’s Twitter following increased 16 percent. Throughout 2017, several topics emerged as the most popular in terms of reach and engagement. Public meeting posts reached the most people (145,250), followed by topics involving roadway projects, planning and programs (104,915). The most engaging posts were those that helped people understand who the NCTCOG Transportation Department is by adding a “face” to the brand. These are messages that may not have related directly to transportation, but demonstrated a more conversational tone. Although few in number, these “about us” posts resulted in the highest percentage interactions from social media users of any posts during the year. Air quality is an important factor that must be weighed in the development of the Dallas-Fort Worth area’s transportation system. Clean Air Action Day is the signature event used by NCTCOG’s Air North Texas campaign to encourage the individuals and employers to become part of the air quality solution. On June 23, 2017, more than 1,100 North Texans took steps toward improving air quality in support of Clean Air Action Day. Through this event, Air North Texas encourages North Texans to make choices that contribute toward reduced emissions and better air quality and log their choices at www.airnorthtexas.org/cleanairactionday. Air North Texas is just one example of how the region’s residents are making a difference. There are many other opportunities to contribute to a transportation system that preserves the natural surroundings. Start by interacting with us. We are listening. Keep it up!